Summary: A mother and her child are abducted by Martians to preserve their robotic family order. 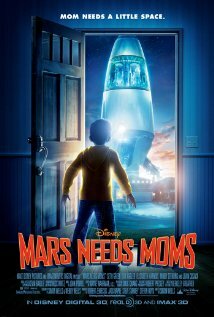 The title “Mars Needs Moms” doesn’t generate much interest by itself. But cultural fascination with Mars is expanded in this low-achieving Disney film about Martians and their being more advanced than we Earthlings (the mould hasn’t been broken since what seems like an eternity in sci-fi times). “Milo” (Seth Green, voice) is an ordinary kid at odds with his rather attractive mother (Joan Cusack, voice) who does her motherly duties with regard to her young son as he tries and tries to get his way when his father (Tom Everett Scott, voice) is out of town. Sent to his room for disobedience, Milo wakes up in the night to find his mother being abducted by a spacecraft. Hitching a ride, he finds mom asleep and himself having to duck for cover in a Martian garbage scow where he meets the lightheartedly looney, “Griggle” (Dan Fogler, voice) who rescues him. From the start, Mars Needs Moms is taken in a weird direction, as an innuendo-ridden, borderline creepy, and often bizarre but well-animated work that at last manages to grow and stay likable. This is despite an obvious head villain (Mindy Sterling, voice) whom you knew from the moment you saw her could only be the big boss baddie, but that’s what the adults will be saying, not the kids. Mom is shown out in the harshly cold Martian climate with exposed skin, and yet she seems unaffected by it. The Martians themselves have to live within domed-off, moon base-type cities with an artificially maintained, oxygen-based climate like that of Earth. Wouldn’t life there have evolved to survive in the natural environment? And how Griggle has managed to hide, feed, and clothe himself on an alien world in a garbage scow for 20+ years is unanswerable, as is his (non-password protected?) use of Martian computers in that environment. Full of unlikelihoods and last minute rescues to carry on with the story, the whole thing is as bizarre as Griggle’s crush, “Ki” (Elisabeth Harnois) whose only knowledge of English was obtained from watching old hipster TV program blips from the 60s. Yes, Ki is the Martian equivalent of an accomplished feminist, a hippie-chick. And if the last few years with animated films has taught us anything, it has taught us that there has to be some copying going on, and it’s done here with another cute robot pet thingy scooting around to help play a part in the plot. The little bugger is sympathetic to Milo’s plight, and in his own squeaky, noise-making way, helps out. In the ship, when Milo is rescued by Griggle, he notices that his most recent memories are of Top Gun and Reagan’s space program. Gribble has his own abduction past, and as you might expect, won’t just tell Milo where his mother is being held. He has to be won over. The dramedy brought in by Griggle may offset his creepy appearance and come-off, as his character is the only one of exceptional vibrancy that doesn't feel forced. Milo learns that Martians need moms to instill motherly instincts and discipline into their hatchlings...through a vaporizing ray? Well, that's how they do it. He's got to save mom before it's too late. This may disturb some young viewers. Technology aside, our Martians only care about order and discipline, and for reasons never satisfactorily explained, need human moms to download into the bots the necessary maternal instincts. Mars has really gotten away from the family unit. Apparently, they have no Dr. James Dobsons of their own. The plot is rather preposterous in the name of an old fascination with Mars that has by now been played to death, but is here housed in a movie where the ideal audience won’t know the difference. The adults will notice. They will also notice some disturbing subtext: the males, almost never referred to in the film (on Mars or Earth except but for a few moments) are absent, saving for when they are portrayed as wild and bullish, as “restless native” tribesmen in the Martian men/creatures (shown as stupid, brutish, and virtually unneeded). Call it just a tribute to women and mothers, or call it a rather loud voice for feminism in the vessel of a kid’s movie. The film's worth as a movie about a child who learns the value of having a mother and father who care enough to remind him to eat his broccoli and when to go to bed doesn’t entirely rise above its smarmy use of clichéd and outdated family dialog. Still, character like-ability is such that a young enough crowd (3 to 9 years) may not notice any of its faults, but might actually enjoy it.